Alternatively called ‘white gold’, ‘organic gemstones’, or ‘bloody teeth’, ivory from elephant tusks has become the latest conflict resource in Africa. A burgeoning appetite in Asian marketplaces is fuelling demand for ivory that is being met by increasingly sophisticated and ruthless criminal syndicates and armed militia. In 2013, over 20,000 elephants are reported to have been unlawfully killed in Africa, part of a worrying trend which is threatening the survival of elephants and testing the strength of international protection of these endangered species. Appendix I offers the highest level of protection. It lists ‘all species threatened with extinction which are or may be affected by trade’. Accordingly, international trade in these animals is totally prohibited except where the trade is for a non-commercial purpose such a scientific research. Comprised of approximately 3% of species listed under CITES, Appendix I animals include tigers, giant pandas, orang-utans and both Asian and African elephants. Appendix II lists wildlife such as hippopotamuses and certain types of orchids that are not yet at risk of extinction but which could be threatened by unlimited trade. Appendix II also includes species that look closely enough like others already on the list to promote conservation of the already-listed species. Commercial trade in Appendix II listed species is allowed when conditions are satisfied, such as when a ‘Scientific Authority of the State of export has advised that such export will not be detrimental to the survival of that species’. Approximately 96% of the wildlife species listed are protected under Appendix II. Appendix III of CITES lists species that are only protected under national laws of a State party and the State has requested cooperation from other States to aid in conserving those species. Commercial trade in these species must not contravene national laws and requires the presentation of export permits and certificates of origin. The wildlife listed in Appendix III comprises only around 1% of the species listed in CITES. Examples include the four-horned antelope (protected in Nepal), the golden jackal (protected in India) and the double-striped thick-knee bird (protected in Guatemala). In the 1980s, widespread poaching wiped out almost half of Africa’s elephant population, which prompted African elephants to be added to Appendix I of CITES. This effected a global ban on sales of ivory and elephant numbers slowly recovered. But then individual African countries (among them Zimbabwe, led by Robert Mugabe) started disobeying the ban. This then led to some legal ‘one-off’ sales of ivory by Zimbabwe, Botswana and Namibia in 1999 and then 2002. In 2008, CITES gave in to aggressive lobbying by China and sanctioned another ‘one-off’ sale of 102 tonnes of stockpiled ivory to Chinese and Japanese traders. This controversial sale raised US$15.4 million for local African communities and elephant conservation. Supporters of the sale hoped that an influx of cheap, legal ivory would save elephants by undercutting the illegal trade, while opponents warned that it would revive the market. The opponents were right. Camouflaged by a flurry of legal ivory transactions, the black market for ivory flourished. Since 2008, ivory prices (and elephant casualties) have climbed steeply. In June 2014, the CITES Secretariat published a report stating that poaching has risen back to unsustainable levels, with over 20,000 African elephants poached in 2013. The report also shows a marked increase in seizures of large ivory shipments of over 500kg, which suggests the involvement of transnational organised crime. Wildlife trafficking is a lucrative trade, particularly in tumultuous and impoverished nations. Estimated to have a value of up to US$20 billion annually, it is characterised as a high-profit, low-risk crime. Illicit trade in ivory, in particular, is facilitated by political unrest, porous borders and corrupt officials. Notorious extremist militia groups such as the Lord’s Resistance Army and the Janjaweed are said to use elephant poaching and ivory trafficking to sustain their other crimes. A large proportion of this ivory is smuggled into Asia, where prices are soaring and one pair of tusks can be worth more than 10 times the average annual income in many African countries. Is CITES protecting the elephants? It has not escaped the notice of the CITES Standing Committee that, despite being afforded maximum protection under its Appendix I, elephants are still being systematically slaughtered across Africa. In March 2012, at the 16th meeting of the Conference of the Parties of CITES (CoP16) in Bangkok, eight countries from Africa to Asia were identified as having significant involvement in global ivory trafficking: Kenya, Tanzania and Uganda as source and exit points in Africa; Malaysia, Philippines and Vietnam as transit countries; and most importantly, China and Thailand as the end-use markets which are driving the demand for ivory. Each of these countries were required by CITES to develop action plans demonstrating how they intend to stem the flow of banned ivory. Despite the chastisements and the action plans of CoP16, an undercover survey conducted in Bangkok showed that the ivory market had roughly doubled in size from January 2013 to May 2014 and concludes that the vast majority of the ivory sold in Thailand is illegal under CITES. This report was published days before the next intercessional meeting of the CITES Standing Committee. Unsurprisingly, Thailand’s lack of progress was heavily criticised by the CITES Standing Committee. The meeting concluded with Thailand being given an onerous timetable of actions to be completed to curb the illicit ivory trade, this time backed with the threat of trade sanctions. It was decided that if Thailand had not made sufficient advances in this regard, members of the CITES Standing Committee would vote on whether punitive trade sanctions should be imposed against Thailand, depriving the country of its lucrative orchid and exotic wood exports. These actions have been widely welcomed by the media and conservation groups such as the World Wildlife Fund. Thailand’s failure to meet its CITES obligations and its public rebuke from CITES, however, has diverted attention from China’s inaction. As the other country identified in CoP16 as an end-market for trafficked ivory, it is said that China’s vast and proliferating middle class is the biggest driver of demand for ivory. As one of the fastest growing economies in the world, China’s GDP is well over 20 times that of Thailand. Whilst this means China is not as vulnerable to sanctions such as those facing Thailand, it also means that China is much better placed to make a real impact. It will be necessary, therefore, for CITES to exert pressure on China to put an end to its substantial part in this illicit trade. The alternative is the gradual decimation of the elephant population and the inestimable consequences of living in a world with no more elephants (but littered with bits of elephant teeth). Report of the CITES secretariat. Convention on International Trade in Endangered Species of Wild Fauna and Flora, Article II, paragraph 1. Convention on International Trade in Endangered Species of Wild Fauna and Flora, Article IV, paragraph 2(a). ‘Tackling the Ivories, The Status of the US Trade in Elephant and Hippo Ivory’, TRAFFIC North America, World Wildlife Fund, September 2004. ‘Ivory auctions raise 15 million USD for elephant conservation’, CITES Press Release, 7 November 2008. 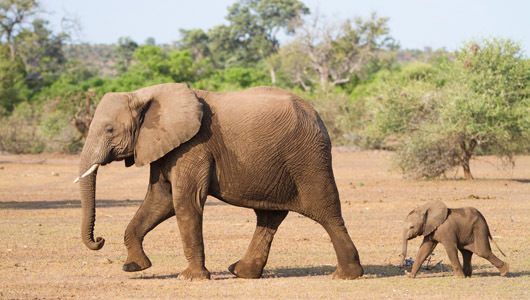 ‘Elephant Conservation, Illegal Killing and Ivory Trade’, CITES, Sixty-fifth meeting of the Standing Committee Geneva (Switzerland), 7-11 July 2014. Elephant poaching and ivory smuggling figures released today, CITES Press Release, 13 June 2014. The number of worked ivory products found for sale rose from 5,865 and the number of ivory retail outlets rose from 61 to 105. ‘Polishing off the ivory: Surveys of Thailand’s ivory market’, TRAFFIC, World Wildlife Fund, 2 July 2014. 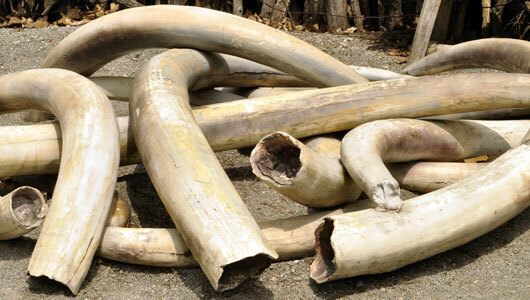 ‘From Elephants’ Mouths, an Illicit Trail to China’, New York Times, 1 March 2013.